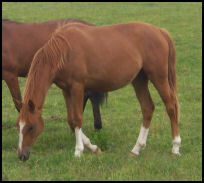 Quantoch Law is a 2008 Hanoverian foal born here at the stud to mature 16.2hh. Her Sire is the very exciting young stallion Quaterback. He was Bundeschampion of three year old riding horses in 2006 with the outside test riders in Warendorf giving him the dream score of 10.0. He was also the winner of his 30-day test with a final score of 9.14 in dressage, an 8.43 for jumping and an overall score of 8.89. Quaterback has unbelievably dynamic movements and is of outstanding type. Quaterback comes from one of the most successful mare lines of modern day. His Dam Passionata is a half-sister of the World Champion and double Bundeschampion, Poetin. Her full brothers Samba Hit I to IV produced superb presentations at the Bundeschampionat. Quaterback's successful advanced level Sire Quaterman also participated in several Bundeschampionats and is deemed one of the best sires for passing on excellent movement. 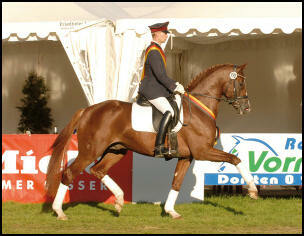 The Grandsire Quando Quando took 15th place at the World Championships in Aachen in 2006 under Kristy Oatley-Nist. Quaterback's pedigree has a depth of multi talented performance from all sides. Quantoch's Dam is our mare Winnie by the legendary Weltmeyer. Weltmeyer was 1998 Hanoverian Stallion of the Year and has produced many graded sons, top class performance offspring and high priced auction horses. He has a huge reputation as an exceptional damsire which is why we are delighted to retain Quantoch as a future broodmare. Quantoch is a striking, modern dressage type with extravagant up hill movement combined with a powerful engine that would be expected from her breeding.